A trailblazer for women attorneys in San Diego, Mary Harvey was one of 63 women attorneys in the city when she graduated from the University of San Diego School of Law in 1961. At the time, the District Attorney’s office did not have female prosecutors and private law firms were reluctant to hire her, so she launched a long legal career that spanned more than three decades as a civil and criminal litigator who practiced family and probate law all the while being a strong civil rights activist. 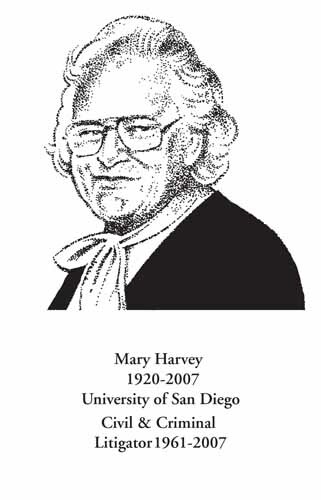 Ms. Harvey served on 18 San Diego County Bar Association committees, was on the American Civil Liberties Union legal panel for 20 years, and was a member of the State Bar Commission on Judicial Nominees for 11 years in addition to being a member of Lawyers Club of San Diego and her volunteer work on civil rights issues. That work took her to the streets where, during the Vietnam War, she represented protesters who were arrested for violating a loitering ordinance. Ms. Harvey succeeded in getting the ordinance declared unconstitutional. And she took great pride in the fact that her civil rights work of the 1960’s and 1970’s resulted in the FBI opening a file on her. Ms. Harvey was born in Leon, Iowa, a town of 2,000 residents. She graduated from the University of Chicago with a history degree before joining the American Red Cross during World War II. She was an administrator at Red Cross hospitals in Austria, Germany, Burma and India. She made her was to San Diego to be the general manger of the San Diego Municipal Employees Association, a labor union for city employees. The University of San Diego School of Law recognized her lifetime of accomplishments in 1996 and named her a distinguished alumna. Ms. Harvey is survived by a niece, Laura; and two nephews.